The Plot: Onslaught’s psionic storm has disrupted Swarm’s body, leading him to invade the Seismoharmonic Institute and demand the scientists reunite his mutated bee colony. Thousands of bees invade the city as Swarm builds more and more mass. Spider-Man finally locates Swarm near Broadway, where he’s grown to a monstrous size. The Subplots: Peter and MJ’s sonogram reveals they’re having a girl. Meanwhile, Ben Reilly’s apartment is taken over by Jimmy Six and his girlfriend Harleen. Jimmy agrees to leave when Ben tells him he has a date. Later, shortly after meeting Desiree, Ben’s forced to leave and face Swarm. 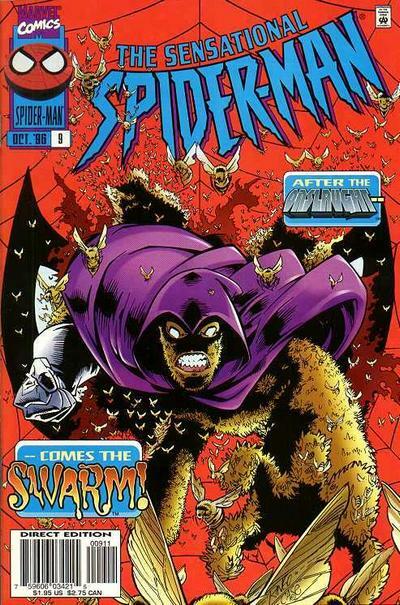 Web of Continuity: Jimmy Six is a character from Howard Mackie’s Spider-Man run. His girlfriend Harleen is a thinly veiled Harley Quinn parody. *See _________ For Details: Onslaught’s psionic storm hit in X-Men #56. Another footnote advises readers to read Amazing Spider-Man #70 for more on Jimmy Six. I assume they mean Spider-Man #70. Approved By The Comics Code Authority: Jimmy Six and Harleen are sharing a bath together. Ben’s arms are strategically placed to make sure nothing’s exposed when they get out of the tub. I Love the ‘90s: Desiree takes Ben to see Rent, “the hottest show on Broadway.” Later, Ben ditches the date by claiming that his beeper is going off. Desiree responds that she didn’t know he had a beeper. None of this means that the issue isn’t any good judged on its own merits. It’s a fairly standard Bronze Age-style Spider-Man story, right down to Peter/Ben lying to his date in order to change clothes and go fight the bad guy. Even if he isn’t doing anything earth-shattering with the characters, I am glad Dezago’s rescued Swarm from obscurity, and bringing back Desiree and the Daily Grind characters from Jurgens’ run adds nice continuity to the book. All of this is competently executed, but I think the story has to rely a lot on Wieringo’s art for any energy. 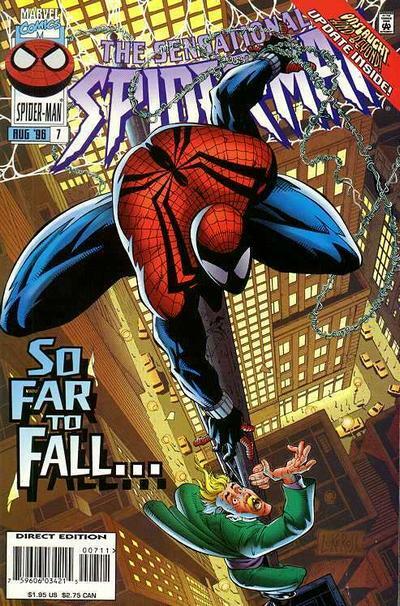 The Plot: Spider-Man investigates a series of robberies by Shocker, Stilt-Man, the Ringer and others. He soon discovers the Looter committing a robbery wearing the Unicorn’s gear. Looter kidnaps Spider-Man and brags about the previous robberies he’s pinned on various supervillains. Spider-Man breaks free and makes his way to the meteor the Looter is studying. Suddenly, SHIELD agents enter, arresting Looter and taking the meteor for their own research. Later, Spider-Man’s shocked when an army of Sentinels flies into Manhattan. The Subplots: Peter Parker is still in the hospital. Mary Jane is adamant that he not aid Ben until the doctors release him. Web of Continuity: The Looter stole the other supervillains’ equipment from the Iron Rock facility, which apparently makes its first full appearance here. And the cliffhanger with the Sentinels is a tie-in with the “Onslaught” crossover. *See _________ For Details: Spider-Man opens the issue looking for the Lizard, following the events of Spectacular Spider-Man #237. 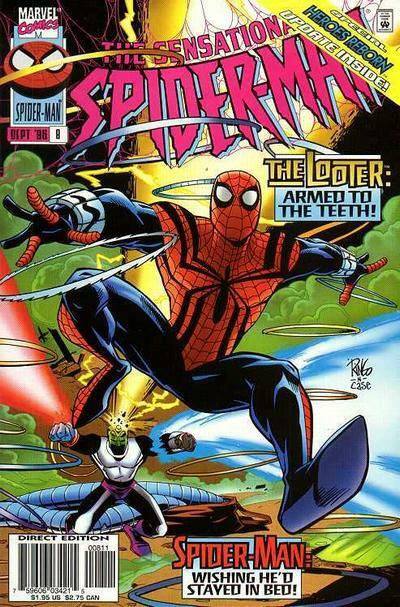 The Looter first appeared in Amazing Spider-Man #36, raided the Iron Rock facility in Spectacular Spider-Man #236, and previously worked as a goon for the female Dr. Octopus in Scarlet Spider #1. 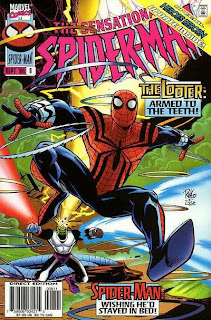 The Sentinel storyline is resolved (as much as anything was “resolved” during “Onslaught”) in Amazing Spider-Man #415. I Love the ‘90s: Spider-Man wonders what it would be like to be David Copperfield, and manages to work in a reference to his then-relationship with Claudia Schifer. Review: This is the official debut of the Todd Dezago/Mike Wieringo team on Sensational Spider-Man. 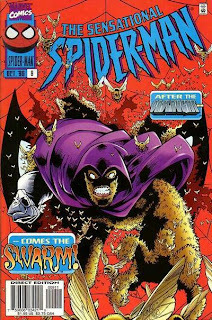 This run has accumulated something of a cult following over the years, but at the time, this seemed like a pretty low-profile creative team to place on the new Spider-Man title. 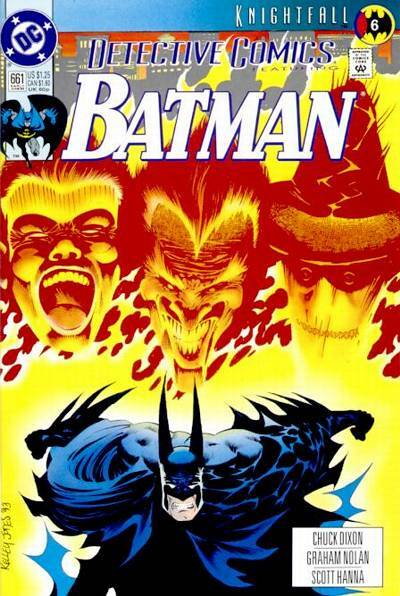 Marvel launched this book as something of a vanity project for Dan Jurgens, and within a few months, you had two relatively obscure creators best known (to Marvel fans) for occasional X-office fill-ins taking over. Reuniting Mark Waid and Mike Wieringo after their Flash run might’ve been almost on the level as getting Jurgens (and I believe this actually was going to be the creative team at one point until Waid dropped out), but if Marvel really wanted to keep the spotlight on this book, they could’ve moved Scott Lobdell and Joe Madureira over from Uncanny X-Men. Clone fatigued or not, people would’ve paid attention to a move like that. Anyway, this is our creative team, and even if Wizard usually ignored them, they’re clearly passionate about doing Spider-Man comics. Wieringo’s Spider-Man is just pure fun, bouncing across the page like a hyperactive child, not burdened by pointless detail lines or senseless rendering. Wieringo doesn’t nail it on every page (he can’t seem to keep the shape of Spidey’s head or the eye design consist for long), but this is the freshest interpretation of the character in a long time. Out of all the artists of this era, I think Wieringo does the best rendition of the Ben Reilly costume. I never had strong feelings either way about that outfit, but Wieringo just makes it look cool. And, thankfully, inker Richard Case puts the appropriate amount of effort required to make the black parts black and not blue, which helps the design immensely. The story is a nice fit with the art, as Todd Dezago creates a Looter story that’s light-hearted without crossing over into camp. Looter’s plan in this issue makes perfect sense in a world populated with dozens of low-level supervillains with specific gimmicks. I could see Marvel villains framing each other for their crimes all of the time, actually. If you’re smart enough to steal everyone else’s gimmick, why not use it when you’re on a crime spree? The ending of the issue, which reveals that the Looter isn’t totally nuts because SHIELD also wants to study the meteors he’s always obsessed with (when written in-character) is also a clever way to redeem the character a bit. However, I do have to wonder about Dezago’s choice to have Looter kidnap Spider-Man and drag his unconscious body to his lair. I get that this sets up Looter stealing Spider-Man’s web-shooters, but a) the stolen web-shooters barely play a role in the story, and b) not once does Spider-Man wonder if Looter looked under his mask during the hour he was unconscious. That’s a pretty glaring omission in an otherwise sharp issue. The Plot: Ben visits Peter in the hospital following his collapse from a mysterious illness. When Ben overhears Peter’s co-workers discussing a news story at a nearby building, he races over as Spider-Man. He meets George, a suicidal man that’s climbed to the top of the aerial tower. When heavy winds slam a news copter covering the story into the building, Spider-Man rescues the crew and relies on George to perform CPR on the victims. George gains a new perspective after the incident and resolves not to give up on life. 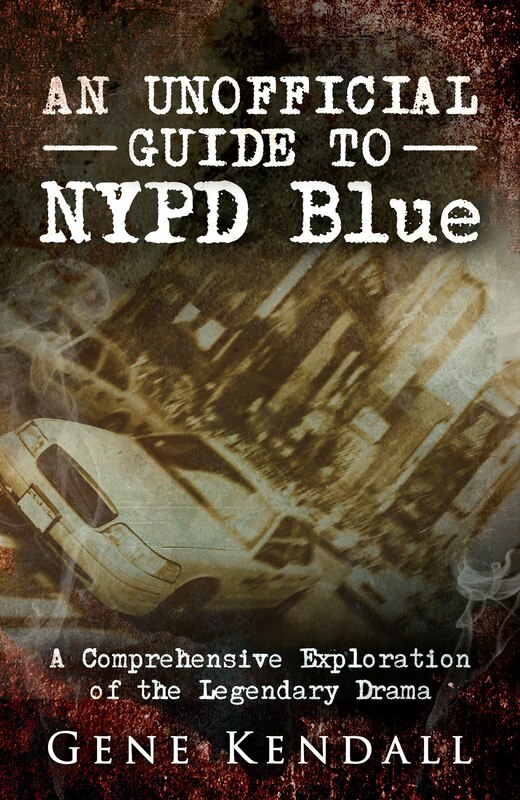 The Subplots: The police believe Shocker is behind a robbery at a diamond exchange. Meanwhile, Dr. Curt Connors is brought in to consult on Peter’s condition. Web of Continuity: One of the Daily Bugle employees refers to “that Walters kid” in the office. This is the first reference to Billy Walters, who becomes Todd Dezago’s pet character during his Sensational run. *See _________ For Details: Peter collapsed in his kitchen in Spider-Man #70. I Love the ‘90s: Spider-Man approaches George by asking him if he has any Grey Poupon. Later, they exchange “You da man!”s when saying goodbye to each other. Review: You might remember that the cover of the previous issue depicted a similar incident, yet it lacked freakish anatomy and questionable perspective. If your fill-in artist isn’t in the same league as the departing one, you might not want to broadcast that fact so loudly on the cover. Not that Luke Ross’ work is all bad, to be fair. 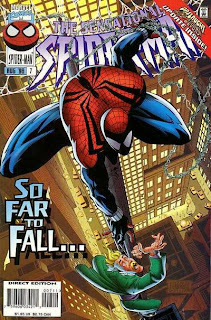 He gets a better grasp on Spider-Man as the issue goes on, and even if he is flagrantly doing a McFarlane pastiche, he does manage to capture some of the elements that made McFarlane’s work so popular. His main failing comes in drawing the civilian cast, as many of the characters look like something out of Dragon Ball Z for much of the issue. 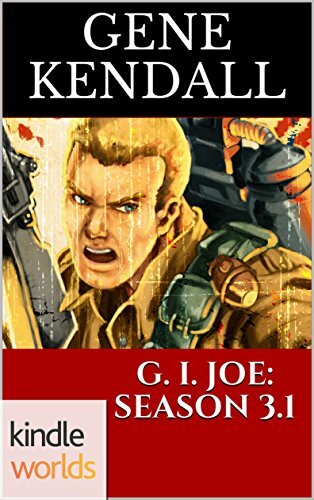 According to “Life of Reilly”, one of the main motivations for doing this storyline was to reintroduce the old supporting cast that had been largely ignored during all of the clone shenanigans. That’s an admirable goal, although I question if Peter really is so close to some of these people that they would visit him in the hospital. (Ken Ellis? Angela Yin?) Also, none of these characters play a real role in the story. Ben’s able to discover the impetus for this issue’s Spider-Man action by overhearing Peter’s co-workers’ conversation, but that could’ve been just as easily accomplished by a breaking news bulletin on the television in Peter’s room. Robbie, Flash, Liz, Felicia, and Betty are all here, but none of them have particularly memorable scenes with Peter or Ben. The Spider-Man sequence is also disappointing, since it’s essentially another story of Spider-Man talking someone out of suicide. 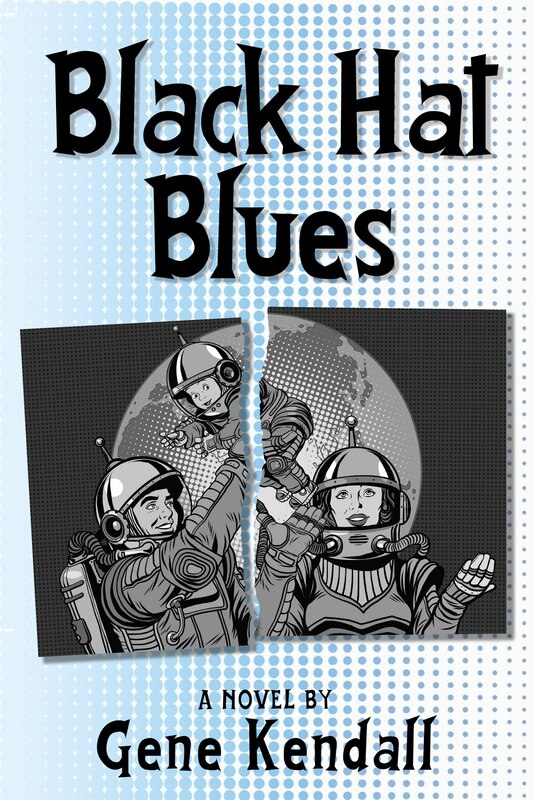 (Are there enough of those stories for their own trade paperback by now?) I’ll give Dezago credit for the helicopter crash idea, though, since that is a less obvious means of inserting action into the story, and it’s a break from the standard armed robbers Spider-Man’s faced in almost every issue of this book so far. Summary: Joker and Scarecrow cause havoc at the Gotham River Tunnel, with Mayor Krol as their hostage. Batman arrives and is soon sprayed by Scarecrow’s fear gas. He fights his way through the effects and attacks the Joker, but their fight is ended when Scarecrow uses a rocket launcher to start a flood. The villains leave while Batman is left to rescue Mayor Krol. Irrelevant Continuity: Jason Todd is still dead at this point, as he should be. The implication from this story is that this is Batman’s first meeting with Joker since the “Death in the Family” storyline. Review: This is Moench’s best chapter of the storyline so far, as he finds the right balance between traditional superheroics and the heightened sense of mayhem that’s needed to sell “Knightfall” effectively. 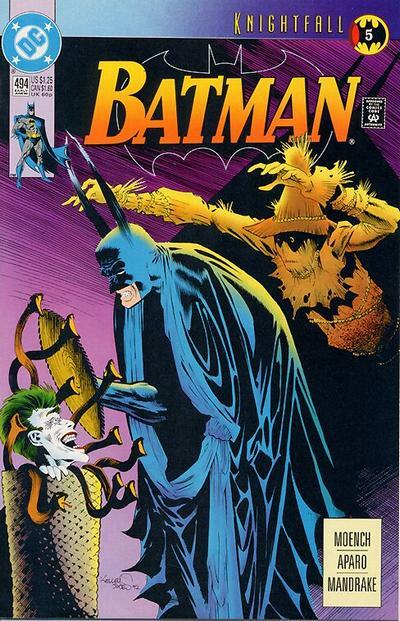 Joker and Scarecrow are given several pages to simply destroy everything in their path, a bender that’s noticeably violent, but not graphic or terribly dark. 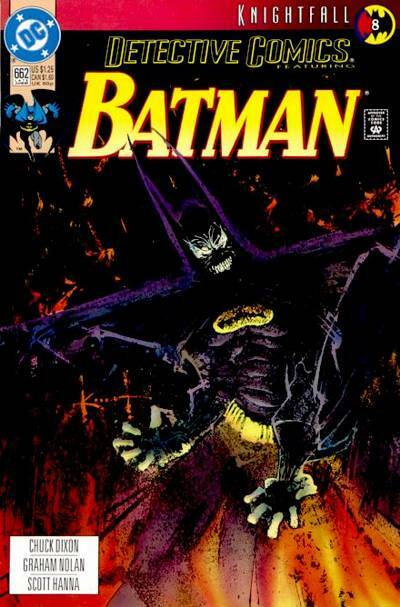 When Batman does confront the villains, Moench is able to convey Batman’s frayed state of mind and guilt over Jason Todd’s murder at the Joker’s hands without going overboard. Forcing him to see visions of Jason through the Scarecrow’s fear gas is another smart use of the characters, even if the scene is surprisingly short. And it’s also great to see Jim Aparo, the definitive Batman artist of this era and the penciler of “Death in the Family,” actually draw Batman’s rematch with the Joker. A rematch that consists of Batman just relentlessly beating him over and over again. 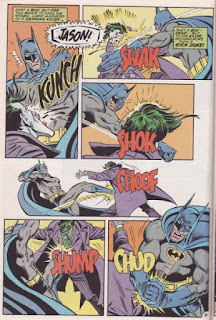 This kind of stunt has been done to death by now, but I think at the time this was one of the few genuinely violent Batman/Joker confrontations in print. Summary: The Riddler’s gang turns against him, forcing him to work alone. He targets a live talk show in order to broadcast his riddles to the public. Robin decides to apprehend Riddler while Batman’s busy confronting Firefly. 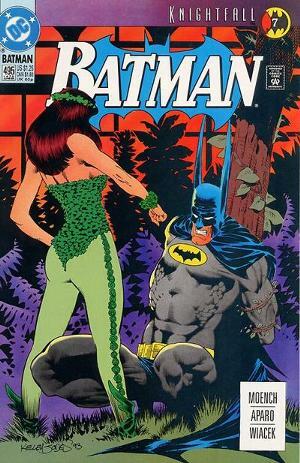 Batman defeats Firefly at the Gotham Zoo, while the Huntress suddenly appears across town and overwhelms the Riddler’s former henchmen. Robin stops the Riddler, but Sergeant Bullock chastises him for behaving recklessly during a hostage situation. Dramatic Exits: Robin abruptly disappears on Sgt. Bullock while he’s in the middle of telling him off. I Love the ‘90s: The Riddler takes over the “Cassie Josie Rudolpho Show,” which is clearly a Sally Jesse Raphael parody. Review: Isn’t this the third Detective issue in a row that shifts the focus from Batman to Robin? I suspect Dixon realized that issue after issue of Batman pushing himself to the brink while fighting second-stringers would get old fast, so perhaps he decided to turn the spotlight on Robin for a change of pace. Even though the story follows the same basic formula as most of the “Knightfall” issues, there is a sense that some advancement is taking place. I’m assuming this chapter marks the end of the ongoing Dr. Flanders gag, as Flanders is forced to abandon his philosophy when confronted by the Riddler, who’s quite proud of being insane. (Although lumping Riddler in with all of the “crazy” Batman villains was still a new idea at the time, right?) Having the Huntress stop the Riddler’s gang also seems to be paying off an ongoing storyline, establishing her capable enough to solve the clues Riddler dropped on television and apprehend his gang. And Batman’s finally starting to realize that he’s pushed himself too far, even though the storyline’s still several issues away from bringing in his replacement. None of this is bad, but if this truly was the end of Dr. Flanders’ run, you would think Dixon would’ve gotten more material out of bringing the pop psychologist face-to-face with one of the villains he defends. Having Robin take out the Riddler by spraying his hand with foam from a distance is also a bit of an anti-climax. It is interesting to see Bullock cast as the voice of reason, though. Establishing that Robin is still green enough to make basic mistakes helps to establish that Batman has legitimate reasons for holding Robin back, making this one of the few good decisions Batman makes during this storyline. Summary: Batman attaches himself to Firefly as he uses his wings to fly away, but is unable to capture him. Later, as Bruce Wayne, he attends a charitable function that’s interrupted by Poison Ivy. Batman avoids breathing the spores that turn the attendants into Poison Ivy’s zombies, and soon changes into costume and defeats her. Outside, Bane watches the events. He discerns by looking at Bruce Wayne that he’s truly Batman. Meanwhile, Azrael practices fighting crime solo, and Joker and Scarecrow trick a SWAT team into an explosive trap. Irrelevant Continuity: Batman has begun using his rope gun, a device made popular by the ‘90s animated series. 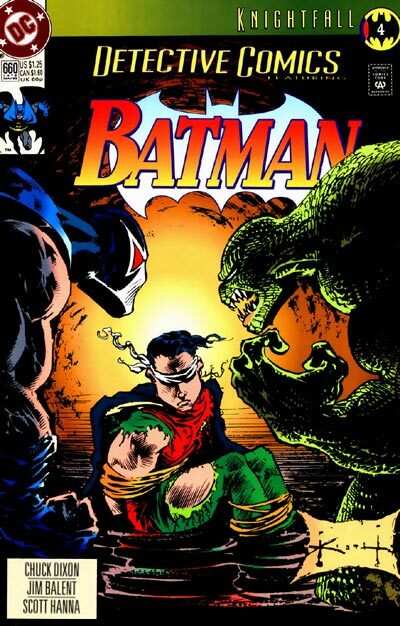 In terms of the “Knightfall” crossover, the major advancement this issue is Bane’s discovery of Batman’s secret identity. And it’s just as lame as my summary of the issue might lead you to believe. Bane merely looks at Bruce Wayne, and after only meeting Batman once in a dark warehouse, instantly recognizes his secret identity. 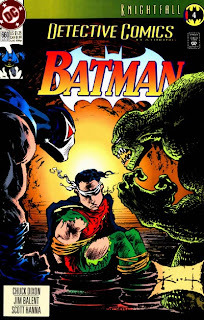 The original Vengeance of Bane one-shot went out of its way to justify Bane’s physical prowess and mental capabilities in order to sell him as a legitimate character and not a plot device. Here, he’s all plot device. I don’t want to use those two words that fans love to throw around when complaining about characters that are insanely competent and able to perform unimaginable feats, but…how else could you describe him? To his credit, Chuck Dixon seems to have a firm grasp on Bane, but Moench’s stories are just coming across as if he's bored and going through the motions. Summary: Joker and Scarecrow force the mayor to instigate a firefighters’ strike, as Firefly continues to burn various Gotham landmarks. Batman allows Robin to investigate Firefly, and after researching his childhood as orphan Garfield Lynns, Robin deduces Firefly’s next target and notifies Batman. Batman arrives and tries to stop Firefly from leaving the scene, but instead drags him down into the fire as the building collapses. Meanwhile, Riddler sends a letter to the police, and Ventriloquist continues his search for Scarface. Dramatic Exits: A nun that knew Garfield Lynns as a child abruptly disappears after giving Robin information on his sister. Robin remarks that she could give Batman lessons on dramatic exits. “Huh?” Moment: Speaking of that nun, for some reason she’s only depicted in shadows during the story. And there’s no obvious reason for her to suddenly disappear, making me wonder if this was intended as the set up for another mystery. I Love the ‘90s: Robin decides to search credit bureaus and voter registrations to find Firefly’s sister, which probably were his only options pre-Google. Dr. Simpson Flanders also appears on what’s clearly an analogue for Rush Limbaugh’s ‘90s TV show. Review: We’re still following the same basic structure as the previous chapters, although this issue allows Robin to actually do more than just complain about Batman’s attitude, and there are a few amusing moments with some of the other Arkham escapees. Riddler has my favorite scene, as he painstakingly spends time writing the perfect riddle, only to have his letter sit on a police officer’s desk because they’re too busy to do little things like open the mail. I also like Ventriloquist’s subplot, which has him torturing the lawyer who last saw his dummy, although unfortunately the art and colors make him look virtually identical to Mayor Krol, who’s also being tortured while in his pajamas during a different subplot. Batman’s spent a lot of time fighting numerous C-list villains since the storyline began, but this chapter manages to get the best material out of the concept so far. 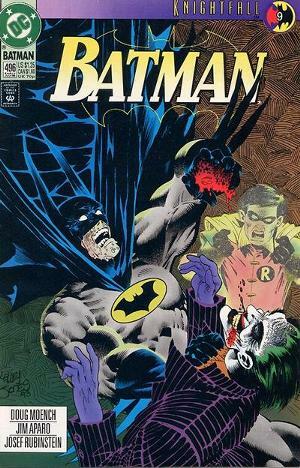 The battle-fatigued Batman material doesn’t offer any new angles, but this issue does allow Robin to perform actual detective work and track down a villain, a staple of Batman and Robin adventures that “Knightfall” has only skimmed over up to now. The rationalization for Firefly’s crime, he’s destroying all of the places potential foster parents promised to take him as a child but never did, also reminds me of something you could easily see on Batman The Animated Series. Dixon also continues to write a smart, sympathetic Robin, which is a precursor to the solid work he’ll do on that character’s solo title. Summary: Robin escapes the sewers and recuperates at the Batcave. He tries to convince Batman to allow him and Azrael to help, but Batman refuses. Meanwhile, the Joker teams with Cornelius Stirk to kidnap Commissioner Gordon. 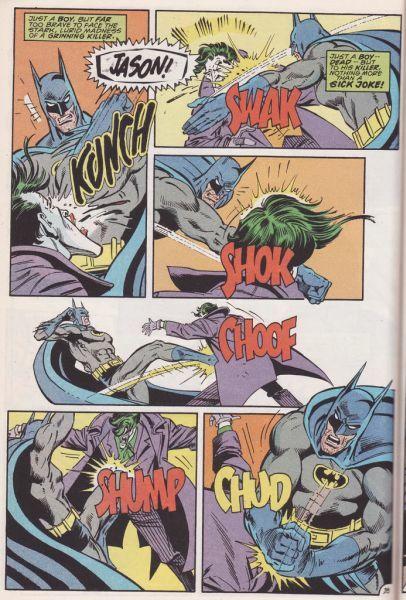 Stirk soon disobeys Joker’s orders and tries to kill Gordon, who’s narrowly rescued by Batman. Scarecrow locates Joker and chastises him for working with an amateur. He suggests a bigger target, Mayor Krol. The Joker brags to Scarecrow that he’s invulnerable to fear gas for the first time. He’ll continue to do this in all of his appearances with Scarecrow until he finally decides to use it against the Joker. Before Joker and Scarecrow invade his bedroom, the mayor threatens to call in the National Guard to stop the Arkham escapees. Gordon’s convinced this will destroy his career. Cornelius Stirk is a serial killer with some form of hypnotic powers. He first appeared in Detective Comics #592. At this point in continuity, the poor area of Gotham is called “The Hub.” Not to be confused with a cable channel devoted to 1980s nostalgia and selling Hasbro toys, of course. Total N00B: A woman named Dr. Shondra Kinsolving calls Bruce Wayne, upset that he’s ignoring “my treatment.” What exactly her treatment is, or what’s supposed to be wrong with Bruce, is never explained in the story. Commissioner Gordon’s wife, Sara, also makes vague references to something called “the headhunter incident,” which is apparently the story that established why Sara hates Batman. Footnotes would be nice. Review: I’m guessing that Cornelius Stirk is a poor man’s Scarecrow…who’s also a serial killer. Not surprisingly, he was created in the late ‘80s. (Why didn’t they just throw “child molester” in there, too?) Doug Moench doesn’t seem to think too much of the character, since the whole point of this story is to point out that he’s a weak replacement for Scarecrow. 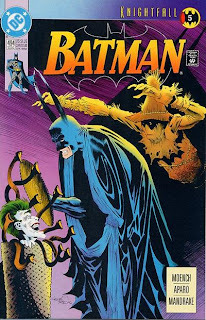 If Joker and Cornelius Stirk actually did something interesting before the Scarecrow made his presence known, I wouldn’t mind this so much, but instead Stirk just chews scenery for a few pages until he’s knocked out by Batman. In Moench’s defense, Cornelius Stirk is an established Arkham inmate, and the premise of this storyline is seeing what the inmates do once they’re free, so using Stirk isn’t a total waste of time. He should’ve been addressed in some manner, I just wish he didn’t come across as such a dull stereotype of a “dark” villain from the grim ‘n gritty ‘80s. The subplots this issue include more scenes of Robin and Alfred worrying about Batman, more scenes of Bane psychoanalyzing Batman from a distance, more scenes of the mayor screaming at Gordon (see a pattern? ), and what’s apparently the continuation of a romantic subplot with Shondra Kinsolving. The scene with Shondra could’ve helped with the monotony, but unfortunately Moench doesn’t bother to actually explain who she even is, and her sudden realization that she might have feelings for Bruce is ridiculously awkward. The only saving grace for this issue is the return of Jim Aparo, whose work is made a little darker with Tom Mandrake’s inks. Summary: As a weary Batman recovers from his fight with Zsasz, Robin follows Bird to his rendezvous with Bane. Bane soon ambushes Robin in the subway, knocking him unconscious and blindfolding him in the sewers. He tries to interrogate Robin for information on Batman, but he’s interrupted by Killer Croc, who wants revenge on Bane for breaking his arms. During Bane and Killer Croc’s fight, the archway breaks, sending Robin and the villains into a strong current. Meanwhile, Ventriloquist continues his search for Scarface. Total N00B: I had no idea Killer Croc was once a respected gang lord in Gotham City at some point in the character’s past. He also speaks with the typical comic book “lisssssp” given to reptilian characters, which he did not do in the animated series. Review: So, yes, I’ll mention again that the story this issue is continuing was not reprinted in the Knightfall trade. It’s not a huge impediment to the overall narrative, the idea that Bane easily beat Croc before and now he wants revenge isn’t hard to grasp, but it’s a little grating that such a giant book is missing stories that clearly should’ve been reprinted. At any rate, this chapter moves Batman’s slow crack-up to the background in order to give Tim Drake (who was so Robin, I don’t care what you try to tell me) the spotlight. And since Chuck Dixon tends to write Tim Drake and Bane very well, it’s not bad at all. Robin’s still a little generic at this stage, but his loyalty to Batman, even when he’s threatened by someone clearly out of his league like Bane, makes him likeable enough for his own chapter. There’s also a nice humanizing moment between Batman and Harvey Bullock, which uses Batman’s fragile state of mind to give the reader something you wouldn’t see in a typical Batman story. I’ve complained about the tone of the previous installments of the event, but this chapter is much closer to the level of seriousness I think the crossover merits. Summary: Scott Summers awakens inside Xavier’s mansion, still reluctant to join his side. Meanwhile, Fred Duncan discovers William Metzger is working with his superiors. Using technology taken from the Sentinel prototype, Metzger plans on helping the government locate mutants. Later, Xavier invites Bobby Drake and Jean Grey to join his new school, while Magneto is rejected by a neophyte mutant. Finally, masked men attack Warren Worthington’s home. They’re stopped by Xavier, who asks Warren to join him. I Love the '90s: William Metzger appears on “Politically Inept with Bill Czar” to discuss the mutant issue. This is a reference to Bill Maher's previous talk show, "Politically Incorrect." Review: So, someone thought it would be a good idea to help the book’s deadline problems by replacing Steve Rude with Paul Smith. That’s…c’mon…was Adam Hughes not available? Smith doesn’t even last a full issue without needing a fill-in, although Michael Ryan’s pages thankfully aren’t a jarring transition. This is possibly the finest looking issue of the series so far; Smith’s interpretation of the gawky teenage X-Men is fantastic, and Paul Mounts’ colors are competitive with any of the Photoshop coloring going on today. The story still suffers from far too much setup, however. There are four different scenes in this issue of either Xavier or Magneto approaching a young mutant and asking him or her to join his side, along with more pages spent hinting that William Metzger is up to something nasty. It’s been four issues now; the guy should’ve done something at this point to appear even somewhat menacing, but instead we’re stuck with more closed-door meetings and talk show appearances. There is some action in the issue, though, as Angel is attacked in his home by a Marvelized version of the Klan. This hate group wears black hoods and burns Xs on lawns instead of crosses, though, so you’ve got to be a sharp reader to pick up on the connection. (They’re such a prosaic, and easily filmable, villain for the X-Men to face, I’m surprised they haven’t made it into any of the X-Men movies yet.) Michael Ryan handles the action well, and the colors used on the flame effect as the house burns look great, but this is still a meager amount of action in a comic filled with monotonous conversation scenes. Summary: X-Man finds himself in an alternate world, one in which he never existed. He sees foes he’s defeated, such as Morbius and the New Brotherhood, killing innocent civilians and various superheroes. After using his telekinetic powers to save Kitty Pryde, X-Man realizes that he must be dreaming. He wakes, and realizes that Caliban has been working for Apocalypse all along. As X-Man is chained to a machine, Apocalypse gloats about his master plan. Continuity Notes: This story is concluded in X-Men #97. “Huh?” Moment: X-Man remarks that Scott and Jean aren’t with the X-Men in this world…one panel after we clearly see Jean fighting with the team. Review: Wow, is this really Terry Kavanagh’s last issue? Where has the time gone, am I right? I could’ve easily read four more years of this insightful, understated piece of classic heroic fiction. C’mon, Marvel…why ditch the guy just when things were starting to warm up? I considered compiling a list of every Terry Kavanagh storyline that was never resolved, or never made much sense in the first place, and all of the brave new directions that went nowhere, but why bother? This stuff is awful. 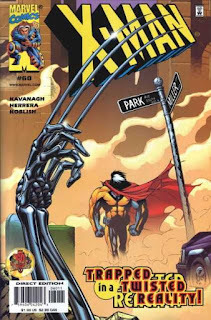 Kavanagh never found a legitimate course to follow while writing this book for years, and to add insult to injury, his final issue is a half-hearted It’s A Wonderful Life reflection on all the good X-Man’s done over the years. (Specifically, the issues Kavanagh has written. I guess if Terry Kavanagh won’t pay tribute to Terry Kavanagh, no one else will.) Goodness, without X-Man, Morbius would’ve turned Spider-Man into a vampire, the deadly Coldsnap-9 would’ve killed thousands of innocent people, and the X-Men would’ve been murdered by the New Brotherhood. In other words, X-Man is absolutely delusional. And an egomaniac, since this is his dream. What other superhero would have an extended dream sequence dedicated to how horrible life would be without his immaculate presence? There’s not even a Clarence the Angel to guide him through this journey – this is simply how X-Man views himself in his dreams. What a way to say goodbye, Terry Kavanagh. Reminding us just how unlikable you’ve made this brat over the years. Summary: Sunspot wakes in a fantasy world, instantly recognizing it as the work of Selene. Selene reveals that she’s forcing the rest of X-Force to live out their fears in the Hellfire Club’s Nightmare Chambers, while Moonstar is tortured by Blackheart in the Club’s basement. 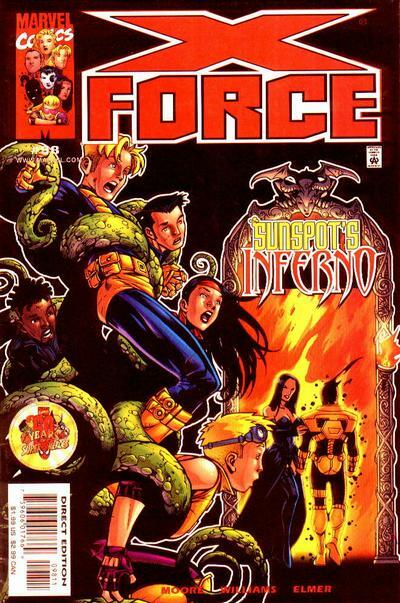 Selene tries to recruit Sunspot into the Hellfire Club as her Black Rook, but he refuses. After Sunspot reunites the team, and Moonstar is rescued by Hela, Selene makes her final offer: the resurrection of Sunspot’s deceased love, Juliana. He reluctantly agrees to join Selene. The rest of X-Force is freed, while Juliana’s soul emerges in the body of a recently deceased teenager. 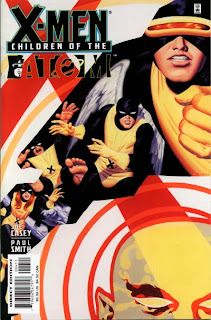 · Sunspot’s age is once again incorrectly listed as fifteen instead of thirteen when his powers emerged. · Selene’s motivation for enticing Sunspot into the Hellfire Club is to enact a final vengeance against his father, a former member she apparently disliked. I don't recall the two of them feuding in an actual story. · Proudstar’s nightmare has him on his reservation moments before Stryfe’s attack, unable to warn them. Cannonball is trapped in a coalmine with his father. Jesse Bedlam is in a mental institution. Meltdown is interrogated by the police regarding the death of Maurice “Tiger” Antonini. This story confirms that she killed Tiger in self-defense during her days as a runaway, and that this is the “dark secret” she’s kept from the team. 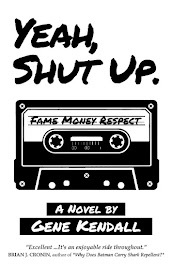 · Juliana goes on to live the life of the girl she’s overtaken and forgets her own identity. This is the ironic twist that comes with Sunspot’s deal with the “Devil” (Blackheart). · The Hellfire guards during this era are actually demons wearing traditional Hellfire uniforms. I Love the '90s: During their fight with Hellfire guards, Jesse Bedlam remarks that he feels like he’s in the moshpit at Woodstock ’99. Review: Wow, forty issues have passed since X-Force #58, a forgettable issue that split up the cast and had each member live out a fantasy. 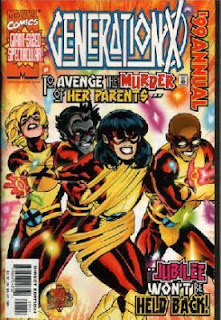 Now, they’re living out nightmares, with the exception of Sunspot, who’s still hung up on the idea of being a famous soccer player. John Francis Moore/Jim Cheung is a stronger creative team than Jeph Loeb/Fill-in Guy, so this is at least more entertaining, although much of this issue also reads as filler. The goal of the story is to get Sunspot in place as the new Black Rook of the Hellfire Club, but the impact of his decision is blunted by the amount of time spent on the numerous cast members. Sunspot doesn’t get to make his choice until the next to last page, leaving his friends only a few panels to actually react to his decision. And this should be a big deal. Sunspot’s been a member of the team for years, and his antipathy towards the Hellfire Club goes all the way back to his first appearance. If you’re doing a story that has Sunspot leaving the team to join the Hellfire Club, this should be full-on classic mutant melodrama. It’s great that Moore is actually using Sunspot’s often ignored past with the Hellfire Club in a story (Who even remembers it was Reese, Macon, and Cole who killed Sunspot’s girlfriend? ), but Juliana is given such a small role in the issue her appearance has little impact. It’s also nice to discover someone at least tried to use the All-New, All-Demonic Hellfire Club in a story outside of Chris Claremont, but again, this is too rushed to be truly engaging. This is a story that didn’t need to kill a dozen pages with fantasy sequences, but did so anyway. Summary: Jubilee notices her parents standing next to Gen X villain Hunter Brawn in an old photograph. She investigates, and discovers a connection between Brawn and the bank where her father served as president. She confronts the bank’s vice president Elliott Lu, who confesses that her parents were killed in a staged car accident after her father discovered Brawn’s money laundering scheme. Jubilee travels to Brawn’s home, unaware that Synch has broken his promise and told Banshee about her plan. Banshee sends the team to aid Jubilee against Legault, but allows her to face Brawn. She refuses to kill him, and allows Brawn to be taken into custody following Lu’s confession. Later, M says goodbye to the team and leaves with her father. Generation X faced Hunter Brawn and his flunky Legault back in Generation X #51. Husk’s potential boyfriend Tristan is Brawn’s grandson. According to Jubilee, the specific date of her parents’ death is October 15th. I’m sure this will come up often in future stories, so let's all make a note of it. The major continuity concern with this issue is the portrayal of the Lees’ deaths. As established in Wolverine #72, Jubilee’s parents were killed in a staged car crash by hitmen Reno & Molokai. Their death was a mistake, as Reno & Molokai were paid to kill a different pair of Lees who lived next door. I Love the '90s: Jubilee uses a pay phone to call Synch, even though it’s established just a few pages earlier that she has a cell phone with her (she plugs it into her laptop to go online). Review: I’m assuming Jay Faerber came across Jubilee’s first entry in the Handbook (the 1989 update miniseries), read the portion about her parents dying in a car accident on Mulholland Drive, and assumed no one had ever done a story addressing this. He’s wrong, of course, but that’s what editors are for. Apparently, they never read those stories, either. But even if they missed the story arc in Wolverine #72-74, you would think Marvel’s editor-in-chief, Bob Harras, would’ve caught this. He was the editor of Wolverine at the time, and the editor of Uncanny X-Men during Jubilee’s first appearances. This is the kind of stuff that was beginning to slip through during the final days of Bob Harras’ stint as editor-in-chief, and it’s a shame that Marvel’s continuity hasn’t recovered to this day. Now, technically, it’s possible to make both stories work. You just have to believe that both Lee families on this street in Beverly Hills had hits placed on them on the same day. If Reno & Molokai made a mistake and grabbed the wrong Lees, it didn’t really matter since they were on someone else’s hit list anyway. This also requires you to believe the first massive coincidence that a pair of goons Wolverine faced earlier in his solo series turned out to be the Lees’ killers, and the second coincidence that the person who ordered the hit would later become an enemy of Jubilee’s team, Generation X. Looking back, Wolverine #72-74 was far from a highlight of Hama’s run, but I still prefer his interpretation of the Lees’ murder. Hama had a habit of inserting tragic consequences based on simple misunderstandings in his work; perhaps most famously in G. I. Joe when several established characters are killed after Tomax and Xamot misunderstand Cobra Commander’s orders to “get rid of them.” Revealing that Jubilee’s parents died because they happened to share the same last name with the wrong family just feels more poignant than a simple story about money laundering. What’s worse is that both stories have the same ending – Jubilee confronting the person (or persons) responsible for her parents’ deaths and finding the strength not to kill them. And, both times, Wolverine plays a role in her decision, even if he isn’t physically in this issue. Ignoring all of the continuity complaints, I do have some admiration for Faerber for at least trying to tell a real story in an annual. Annuals were an absolute dead zone by 1999. No one even bothered to arrange quickie crossovers in them anymore. Faerber’s created a story that not only adds to one character’s established past (admittedly, in a clumsy way), but also impacts the lineup of the team. Throughout the issue, M is dealing with her father’s decision to withdraw her from the school, a choice she isn’t necessarily opposed to. Banshee tries to convince her father to give M the space she needs to grow up and make her own decisions, which Faerber later parallels with Jubilee’s solo mission against Hunter Brawn. Banshee gives Jubilee the freedom to confront Brawn on her own, confident she’ll make the right choice. (Somewhat confident, since he sends Synch and Husk to keep an eye on her.) Later, M says goodbye to the team, acknowledging that no one really liked her, and maybe it’s best this way. Faerber also advances the Tristan Brawn/Husk subplot, as Tristan definitively turns away from his grandfather and becomes a more legitimate love interest for Husk. So, yes, things happen and the story is much more than filler. Unfortunately, it’s built on shaky continuity, and most of the emotional beats of the story were already covered years earlier.